Kanchenjunga north base camp trek itinerary starts from Kathmandu with a flight to Bhadrapur and drives to Taplejung and a long drive from Kathmandu to Taplejung. Kanchenjunga north base camp trekking itinerary covers only one base camp of the Kanchenjunga mountain via Gunsa. Kanchenjunga north base camp offers lots of nice scenery as Tea and Cardamom farming, rice and other farming, Kanchenjunga and it's the range, waterfall, green hills, rivers, valleys, and more. 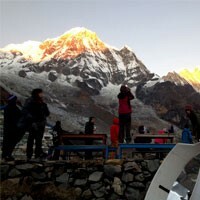 We make customized Kanchenjunga north base camp trek itinerary, Kanchenjunga circuit trek itinerary, Kanchenjunga north and south base camp trek itinerary, adventure Kanchenjunga trek itinerary, and more as your holiday time limit. 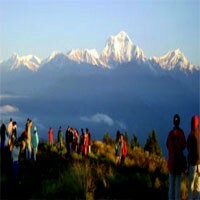 Day 02 : Kathmandu Valley full day Sightseeing and permit making day. Day 03 : Drive to Birtamod(10 hrs.) drive to Taplejung(1820m. )10 hrs. Day 04 : Trek from Taplejung to Sinawa(1070m.) 5 hrs. Day 05 : Trek from Sinawa to Tapethok(1322m.) 6 hrs. Day 06 : Trek from Tapethok to Amjilosa(2498m.) 6 hrs. 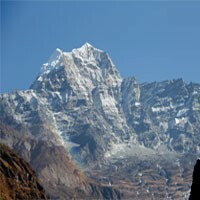 Day 07 : Trek from Amjilosa to Ghunsa(3415m.) 6-7 hrs. Day 08 : Rest and acclimatization day at Ghunsa(3415m.). Day 09 : Trek from Ghunsa to Khambachen(4145m.) 5 hrs. Day 10 : Trek from Khambachen to Lhonak(4790m.) 4 hrs. Day 11 : Trek from Lhonak to Pangpema, kanchenjunga north base camp(5140m.) 4 hrs. Day 12 : Trek back from Pangpema to Khabachen(4145m.) 5 hrs. Day 13 : Trek from Khambachen to Phale(3215m.) 5 hrs. Day 14 : Trek from Phale to Sekathum(1650m. )7 hrs. Day 15 : Trek from Sekathum to Sinuwa(1070m.) 7 hrs. Day 16 : Trek from Sinawa to Taplejung(1820m.) 6 hrs. Day 17 : Drive to Birtamod(10 hrs.) overnight at guesthouse. Day 18 : Fly from chandra gadhi to kathmandu. Fare well dinner with Frolic Adventure. Day 19 : Departure to the international airport for your final flight.